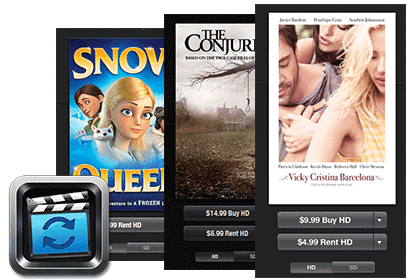 Strip DRM from Rental & Purchased iTunes Movies! Get DRM-Free MP4. 100% lossless quality. Tips: M4VGear is a home edition and is only for personal use. 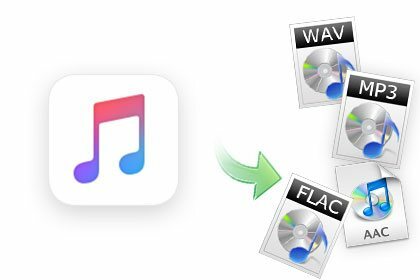 M4VGear DRM Media Converter can keep AC3 Dolby 5.1 audio & AD track when removing DRM from iTunes videos, which is what our competitors cannot do. 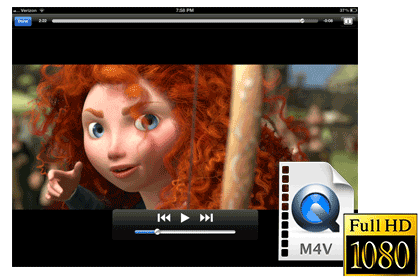 It will be perfect to play DRM-free iTunes videos with 5.1 audio on TV. 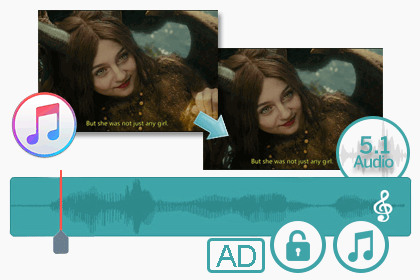 Besides, Multilingual subtitles including CC and audio tracks (including audio descriptions) of iTunes videos can also be saved with this powerful DRM Removal software. In this way, you can choose the subtitle of certain language to be displayed on the screen and the audio track of certain language to be played. 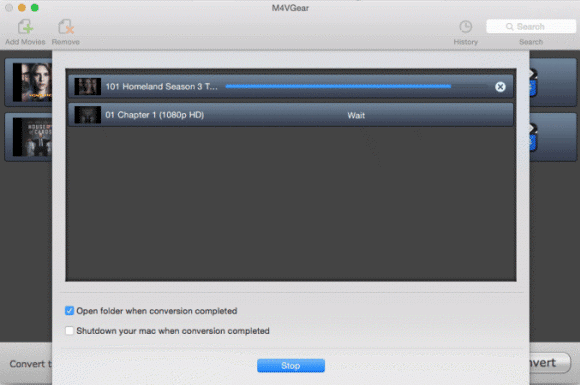 M4VGear adopts an innovative DRM decrypting technique which makes it the fastest DRM remover in the world and capable of removing DRM from your iTunes movie, TV Shows, Music Videos and iTunes Extras at 20X faster speed. Generally, you can remove DRM from a 2-hour movie in about twenty minutes. Far more faster than other similar products in the market. Removing DRM couldn't be easier! M4VGear unlock DRM from iTunes videos and convert them to various video & audio formats such as MP4, MOV, and MP3; mobile devices like iPhone 8/8 plus, iPhone X, iPhone XR, iPhone XS, iPhone XS Max, iPad mini 4, iPad Pro, Samsung Galaxy Note 9, Samsung Galaxy S10, Google Nexus series, Xbox One, PS4, etc; TV console, like Samsung TV, LG TV and SONY TV, etc with suitable bitrate and format. And the program promises you a DRM-free video MP4 format with lossless quality. Looking for a way to convert Apple Music to plain format? Or wanna burn DRM-locked Apple Music to CD for playing on car player? Here Sidify Apple Music Converter can help you solve the above problems. It has an intuitive interface and comes with batch of effective functions, helping users to convert Apple Music songs, iTunes M4P music and iTunes Audiobooks into various formats including MP3, AAC, FLAC and WAV. 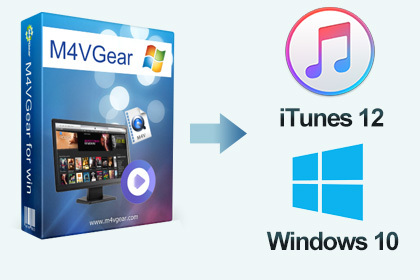 M4VGear DRM Media Converter is completely compatible with Windows XP, Vista, 7, 8, 10 and iTunes 12.9, and will constantly be upgraded for each new system and iTunes. No need to worry about any compatibility issue of the program with your latest Windows OS or iTunes. I love this new update!!!!! It supports keeping movie 5.1 audio track after conversion, this is the feature I am dying for!!! The program directly removes the DRM and exports the .m4v files without protections at an amazing speed. A 2-hour 1080P HD movie can be finished in 10 minutes! Again, absolutely excellent customer service from you - something you rarely find with email support in this day and age. Lightning fast response and very clear and helpful.